The support for the UK's Jeremy Corbyn and the U.S.'s Bernie Sanders seems to be proportional to how much they articulate people's anger at what the upper class (in the UK and US) are doing to create and defend social/economic/political inequality. Bernie Sanders in Iowa increased his support by talking about the need for a "political revolution" and even saying that the U.S. was not a democracy but an oligarchy and therefore even if he were elected president he wouldn't be able to make the changes people want and so it will take an ongoing grassroots movement to make those changes. This sounds very revolutionary on the surface, and it is precisely this revolutionary-sounding rhetoric that is boosting Bernie Sanders's support among ordinary Americans even in "fly-over" Iowa, far from what are considered the coastal centers of radicalism. This suggests that what I have been saying for a long time is true--that the vast majority of ordinary people want an egalitarian revolution to remove the rich from power and have real not fake democracy with no rich and no poor. But there is a problem. Neither Sanders nor Corbyn articulate a vision of HOW to remove the rich from power to have real not fake democracy with no rich and no poor. They don't even advocate removing the rich from power; they only advocate making the rich pay a bit more and ease up on regular people*. In other words, they don't identify the Big Problem and how to solve it. The Big Problem is that our society is based on money: money is power and billionaires have all the power. Whatever the billionaires give one day they merely take back another day in one way or another. Failure to identify and then solve the Big Problem means leaving our society one in which money is power and in which some people continue to own billions of dollars and have all the power. It thus means remaining forever on the treadmill of defeat. We win some reform one day and the rich take it back the next, ad infinitum. The haves will use the power of their wealth to dominate the have-nots forever, regardless of whatever reform they may grant now and then. 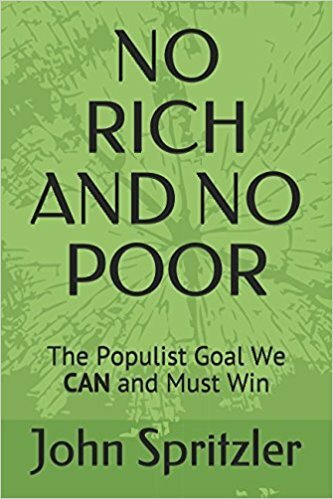 To solve the Big Problem means making our society one that is not based on class inequality, that is not based on money and buying and selling but is based rather on "from each according to ability, to each according to need" as described at http://www.pdrboston.org/egalitarianism . Failure to articulate this as the goal means, implicitly, acceptance of the dictatorship of the rich forever and forever. Now, some people say, "No, you don't have to explicitly identify the Big Problem and explicitly aim to solve it. You can just keep winning reforms and eventually the Big Problem won't exist anymore." Here's why I say this is just not true. First, if one looks at the major social movements of the past, they frequently succeeded in winning what they explicitly aimed to win (the abolition of Jim Crow, the abolition of Apartheid, the 8 hour day, the right to form a labor union), but because they did not explicitly aim to abolish class inequality the class inequality remained intact, as strong as ever. And the victories were easily negated by the ruling elite. Jim Crow was replaced by the New Jim Crow of prison incarceration (see http://newdemocracyworld.org/culture/newjimcrow.html ). Apartheid in South Africa was abolished but now most black South Africans suffer even worse at the hands of the same ruling elite, even though there are now black politicians and corporate managers. There is an 8 hour day but lots of people have to work two or more jobs. You can join a union, but the unions don't act in the interests of the workers (see http://www.newdemocracyworld.org/old/How%20Unions%20Killed.htm). People remain on the treadmill of defeat because there was never a movement aiming explicitly to abolish class inequality. Second, the idea of winning one reform after another until class inequality just withers away is not realistic. The rich use their power to make people have second thoughts about reforms they initially supported. Sometimes, therefore, it's one step forward and two steps backwards. For example, the rich tell people things like this: "If you tax us too much we'll just take our businesses abroad to more business-friendly nations and you'll lose your job. Think about that!" There is really not a persuasive argument against these kinds of threats made by the rich, unless one advocates removing the rich from power altogether and making society one in which there are no rich and poor. Those who don't make this argument explicitly end up bowing to the rich and yielding to their threats. It has happened over and over again. Socialist parties thus end up enforcing austerity, as the one in Greece did when its prime minister was Georgios Papandreou, the president of the Socialist Internationale (read the gory details at https://en.wikipedia.org/wiki/George_Papandreou ). Either we build an explicitly egalitarian revolutionary movement explicitly aiming to abolish class inequality, or we will live under a dictatorship of the rich forever, and the rich will dominate and oppress us forever. That's the choice. Corbyn and Sanders are important to watch and by doing so learn how much support there is for egalitarian revolution. But Corbyn and Sanders are not the leaders we need to solve our Big Problem; they don't even identify what the Big Problem is, never mind talk about actually solving it. The fact that so many ordinary people obviously DO want to solve the Big Problem (watch this video of them saying so: https://www.youtube.com/watch?v=95b3SmBYwfU ) means we have no excuse for not talking explicitly about doing that. It's not true that "the people aren't ready for such revolutionary talk yet"; on the contrary, they're demanding such talk. But they're not getting it. Let's change that. OK? "We need leadership in every country in the world which tells the billionaire class that they cannot have it all. We need economies that work for working families, not just the people on top." Sanders says here that he intends to keep the billionaire class in existence, as the "people on top" with all the money! Sanders says they "cannot have it all," by which he means that they can indeed have the lion's share. What Sanders refuses to acknowledge is that as long as a billionaire class exists, it will use its great wealth, and hence power, to do what billionaire classes do, which is keep society extremely unequal and do terrible, horrible things (like wage unjust Orwellian wars of social control and use public schools to make working class children think they aren't smart enough or hard-working enough to deserve more than their place at the bottom of a society based on class inequality) to maintain the class inequality that the vast majority of ordinary people hate.